"Galitia's like an Undead. It comes to life after dark. It hides its secrets well. And it can off you before you can manage a scream..."
The Galitia Citybook gives you everything you need to run an adventure or campaign in the dark streets and alleys of this burg. Its history and the way it is today; the powerbrokers and the pickpockets; the mages and the madmen, and everything in between. You'll also find new breeds of Unnatural, details on the Widerness surrounding Galitia, rumours and adventure hooks, and more maps than you can shake a conjure stick at. So if you've got the guts, Galitia's waiting. 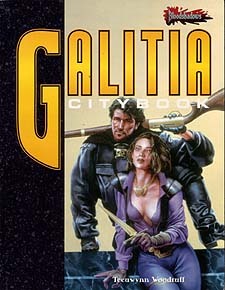 Galitia Citybook is intended for use with the Bloodshadows roleplaying game. You will need the World of Bloodshadows book and the MasterBook to play.